This is an exciting trip for the students as they have the opportunity to study geology that is vastly different than the geology in Northern Ontario. The Southwest terrain is millions of years younger (Paleozoic to Mesozoic Era) than Northern Ontario and, is also free of extensive forests and wet lands. This will make the lithologies (rock types) much easier to study creating a unique experience for the students (not to mention a great reason to escape the -30-degree Celsius winter weather here in Sudbury, Ontario). View a map of their trip and a summary of the itinerary below! For updates and pictures throughout their trip, follow the Harquail School of Earth Sciences on Instagram, Facebook and subscribe to our Newsletter. Starting in Las Vegas, the students will be driving 6 hours through the Basin and Range province, up to the Carlin Trend. The Basin and Range province is a crustal extension that causes valleys and steep hills to form closely together. Once arriving in the Carlin Trend they will be touring three mines. The Carlin Trend is a major gold producing region and also where many international gold companies discovered their first mines. To read more about the geology of the Basin and Range province and the Carlin Trend, visit page 9 of the Field Guide. Next, they will continue driving through the Basin and Range province to arrive in Salt Lake City. Once arriving in Salt Lake City, Professor Erich Petersen from the University of Utah will be taking the students to the Tintic District which is a historically significant mining region of Utah. They will then tour Bingham Canyon Mine, Rio Tinto one of the largest man-made excavations in the world that is considered to have produced more copper than any other mine in history. Part three of the trip involves touring the Colorado Plateau when driving from Salt Lake city to Springdale, Utah. The Colorado Plateau is made up of extremely flat lying volcanic and sedimentary rocks where large rivers eroded distinctive steep canyons (such as Zion National Park and the Grand Canyon). The students will be hiking the Angel’s Landing trail in Zion, where the Navajo Sandstone is very well exposed in steep cliffs and canyons. The Grand Canyon is the best exposure of the Colorado Plateau stratigraphy (the concept of having layers of rock build up over time due to heavy erosion caused by the Colorado river). 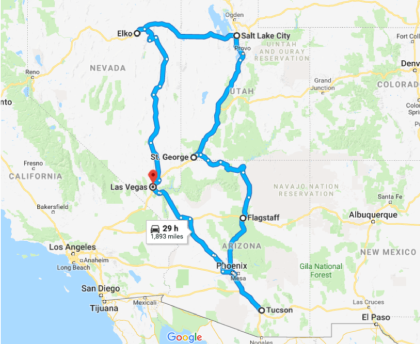 They will then drive to Tuscon, Arizona to visit a region of national parks where exceptionally preserved wind-carved sandstone is the predominant lithology. The region also features sites such as Meteor Crater, one of the best exposed meteorite impacts in the world. The last leg of the trip involves the final mine tour at Ray Mine, Asarco, one of the largest copper reserves in the United States and in the world. They will then visit Kartchner Caverns to view extensive stalactites and stalagmites. The students will complete the trip celebrating their last night in Las Vegas before returning back to Sudbury.